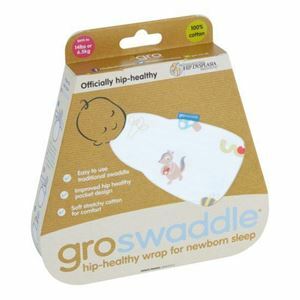 GRO SWADDLE ** NOT AVAILABLE **,The traditional yet Hip Healthy way for newborn sleep - The Gro Swaddle! The Gro Swaddle is the traditional yet modern way of swaddling your baby for a better sleep. Swaddling improves the sleep quality in your little one and reduces the possiility of a baby to get startled in their sleep. Gro Swaddle has been recognised as a Hip Healthy product when used as directed by the Hip Dysplasia Institute. There are no complicated foldings or fastenings and the roomy fabric pocket on the swaddle allows leg movement and allows the child to sleep naturally in a froggy position.